Much of last week was spent with Ham radio activities. Thursday morning began my annual pilgrimage to the Mecca of amateur radio in Dayton OH for what is known as the HamVention. After many years I was running out of things to occupy myself for the two and a half day event, so I volunteered to help. They kept me busy about 4 hours each day. Still I had plenty of time to get around and check out what is new. The HamVention is by far the largest yearly gathering of Ham Operators from around the world. It is the world premier trade show for amateur radio related equipment. 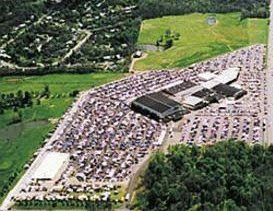 This is the place where manufactures and vendors annually introduce or display their newest and greatest products. The large number of vendors encourages very competitive pricing. In addition there is a flee market area with hundreds of spaces stretching farther than you can see. In this arial photo everything to the left of and behind the buildings (The Hara Arena Complex) is flee market space. The show attracts many non ham visitors come to purchase computers and related gear, which are much in demand for modern ham operations, at well below market price. Many ham radio groups, including the ARRL hold there annual gatherings and dinners in conjunction with the HamVention. Multiple Forums and Discussions are scheduled each hour of every day along with activities to keep spouses and kids with different interests engaged. Ham License sessions are provided. It is a really quit a blast. So now I have cleaned up everything that did not get done while I was gone and am working on a Memorial Day blog. Also Sunday is "Plant a Letterbox" day, so I would like to finish a memorial box to get out. Friday morning I will be off to Detroit to take care of some business and to visit with my Daughter Ellisa and her family. To add to the confusion the church web site crashed and I am struggling to get it back on line. Busy, Busy, Busy. Memories - Revision II and Final?